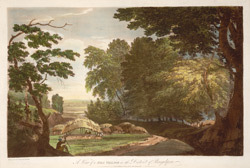 This is plate 25 from William Hodges' book 'Select Views in India'. This picturesque image shows a typical Bengali village near Bhagalpur, an important British military post along the River Ganges. Hodges wrote: "This view of a village in the Hills, in the Bauglepoor District, is given, as the people are wholly a distinct race of men from the Moors and the Hindoos inhabiting the plains." In 1781 Hodges met Augustus Cleveland at Bhagalpur. Cleveland become his great friend and patron.